I have a long day ahead of me. The Carolina Panthers play the Detroit Lions at 1:00 PM but like all good NFL fans I am preparing food at 5:30 AM. Carolina is 7-2 and has won every home game this year. Because of this all diehard fans know that changing anything that has become routine could spoil the mojo and cause the home team to loose. No one wants that debacle on their watch. So we eat the same tailgate food each week. I slow cook Johnsonville Brats (original only) until they are caramelized. 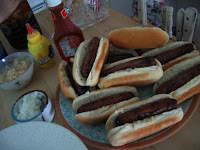 I serve the brats with cooked sliced onions that have been cooked in foil with salt, pepper, butter and garlic. Sorry, no sour kraut in North Carolina just sweet onions from Georgia. Before hand I peel and marinade NC shrimp to be grilled before the brats. We have the same beer in the cooler Michelob Light. My pal brings deviled eggs, bubba burgers and brownies. We wear the same jerseys (never washed) and leave the tailgate area at the same time to arrive at the introductions. I have one friend that wears the same shorts and shirt but now it’s 35 degrees. God bless him he doesn’t want to be the cause of the loss. Today I am taking Cruzan Rum in addition to the beer. It’s cold and Detroit is 0-8. I hope I’m not screwing things up by taking the rum. You can never screw things up by bringing rum, especially Cruzan Rum - its a given, another unquestionable law of the universe. If, Dog Forbid, your team doesn't prevail, it'll clearly have been the result of some other poor schmuck's failure to properly perform his superstitious pre-game rites. So this become a Michael postulate? A new man rule governing all things manly? I like it. I like this especially since I have found a proper liquor store just over the border in SC that sells Cruzan dark in the liter as it was intended to be dispensed. And cheap for stateside at $12. I will load up again at Kmart in Feb for the $5 stuff. The subtle difference is your Rum is cut with natural rain water that fell on the island and mine is Florida tap water used to cut the stuff stateside from bulk containers. I have a sensitive palate. Brats with onions, shrimp, deviled eggs, beer, rum..... I can imagine the effect this diet has on your stomachs and I pity anyone sitting anywhere in your group's vicinity during the game.